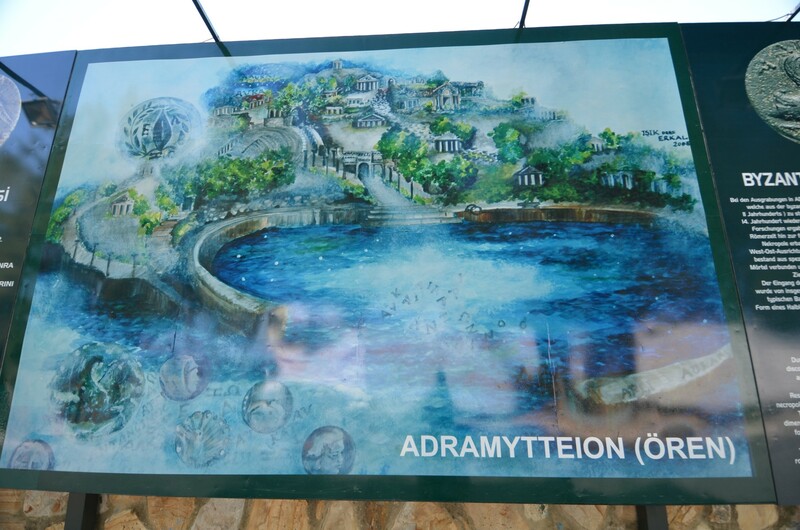 Despite the widespread belief that the ancient city of Adramyttion was situated in modern Edremit, as its name is a corruption of the ancient one. However, the case is a bit more complicated. The ruins of Adramyttion are located in the beach district of the town of Burhaniye, known simply as Ören i.e. ruins, 24 km to the south of Edremit. Recent archaeological research conducted in the area of ​​Burhaniye has provided the evidence that traces of human activity in the area date back to prehistoric times. It is testified by altars and monuments carved into the rock, dating back to the Neolithic period and associated with the cult of the Mother Goddess. In total fifteen such places have been identified so far, hidden in the hills between Burhaniye and Havran. The origins of the settlement, which during the Greek and Roman periods became an important port city in the region, are lost in the mists of history. There are two main theories about the city's foundation. According to the first of them, the city was founded in the 6th century BCE, at the behest of Adramys, the son of the King of Lydia - Alyattes, and the brother of the famous king Croesus. Apparently, Croesus, the last king of Lydia, before ascending to the throne, acted as the governor of Adramyttion. The second theory claims that the settlement is much older, and it was founded, under the name Adra-Mudra, by native Anatolian people - the Luvians. They lived in Asia Minor in the second millennium BCE. For many centuries, Adramyttion functioned as the port and the centre of trade in products originating from forests growing on the slopes of Mount Ida and plains stretching to the east. The turning point in the history of the city was the year 422 BCE. In this time the inhabitants of the island of Delos settled in the city, expelled by the Athenians from their homeland. The Persian satrap of Daskyleion, who managed the western Asia Minor, agreed to accept their presence. Since then, the city of Adramyttion was Hellenised, and figured in the lists as "a Greek city." The laws applied by the rulers of Adramyttion was studied by Aristotle, who presented a typology of political systems of city-states in his work titled Politics. One of the earliest historical references to Adramyttion can be found in Xenophon's Anabasis where the author wrote about the adventures of the Greek mercenaries, returning home from Persia. The final leg of their long march is described in the following words: "Then they marched through the Troad, and after crossing Mount Ida, came first to Antandros, and then went along the coast to the plain of Thebe. They travelled from there by way of Adramyttium and Certanon to the plain of Caicus and so reached Pergamum and Mysia." In the Hellenistic period, due to the strategic location of Adramyttion, frequent battles were fought between the heirs of Alexander the Great near the city. The city was conquered in 302 BCE by Prepelaus, a general in the service of the king of Macedonia. However, in the same year, he lost it to Demetrius I, known as "the one who besieges cities." In 201 BCE, the city was plundered by Philip V of Macedon, also from Macedonia, and in 190 BCE - by Antiochus III the Great, a ruler from the Seleucid dynasty. Finally, Adramyttion was incorporated into the expanding Kingdom of Pergamon, whose kings contributed to its development and prosperity. Under the Roman rule, Adramyttion flourished, as new public buildings, a shipyard, and the school of rhetoric were erected. Until the reign of Emperor Gallienus, i.e. the middle of the 3rd century CE, the city was minting its coins. The famous Roman historian, Pliny the Elder, wrote that Adramyttion was famous for the production of valuable medicated ointment. In the first century CE, the city was repeatedly visited by St. Paul, during his missionary journeys. The city had the status of a bishopric from 431, and its representatives participated in a number of councils and synods. The golden era of Adramyttion ended because the harbour was silted up. The end to the city's existence was put by the Seljuk commander Çaka Bey, who invaded and destroyed the city in 1093. The memory of the city has been preserved in the name of the nearby town of Edremit, founded shortly afterwards by the rulers of Byzantium. 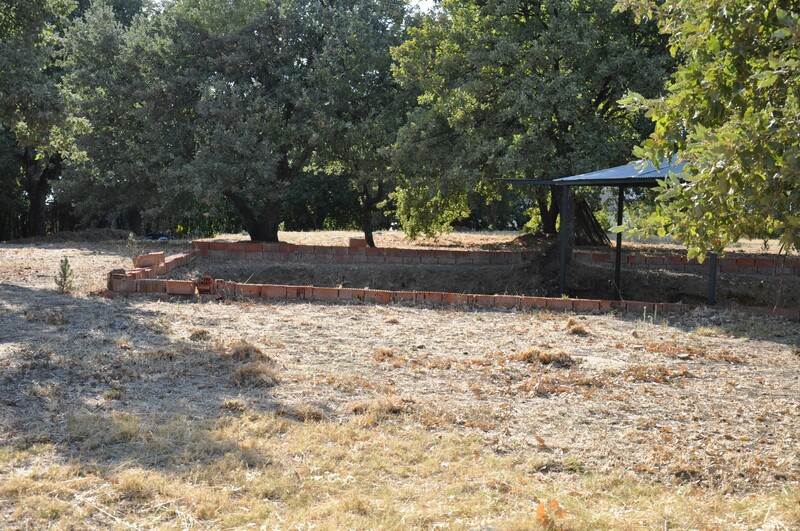 The Turks established a new village in the vicinity of the ancient Adramyttion, under the name Taylıeli. At the beginning of the 14th century, it was managed by the Karasid dynasty (tr. Karesioğulları), when it developed and attracted many immigrants. In the days of the Ottoman Empire, the settlement was renamed as Kemer and attached administratively to Edremit. In 1866, the town became the capital of the district under the name of Burhaniye, derived from the name of the Ottoman prince Şehzade Burhanettin. During the Greco-Turkish War, on the 29th of 1920, the Greek army occupied and set fire to Burhaniye, destroying the main mosque of the town. Currently, Burhaniye is a small town with the population of about 40,000 residents, administratively belonging to Balıkesir Province. It has its harbour and a beach district - Ören - where the ruins of ancient Adramyttion are located. Besides tourism, the primary source of income of its residents is the production of olive oil. The ruined Byzantine church, dating back to the 10-11th century CE, is one of the most attractive buildings unearthed in Adramyttion so far. It was discovered in 2001, during the excavations that took place between 2000 and 2006. The researchers found out that the building was erected in the area of a former necropolis, during the transition from the late Roman period to the early Byzantine era. The church was abandoned in the 14th century, and only its foundations are visible today. The building was erected on a rectangular plan with a semicircular apse, in the east-west alignment. Its dimensions are 22 meters by 12 meters. The church was built with stone blocks connected and plastered with a mortar made of gravel, broken bricks, lime powder, and water. The roof was supported by four pillars. The next round of excavations started in 2012. In September 2017, another discovery from the area of Adramyttion was announced. 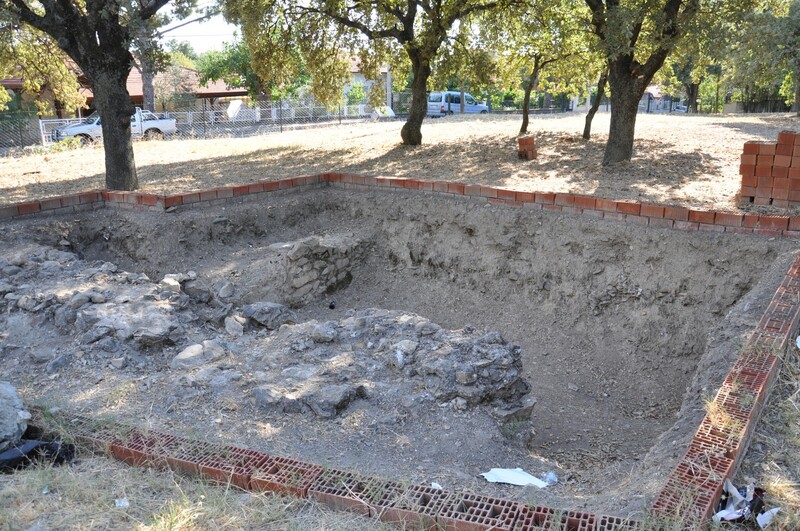 Ruins of a church dating back 800 years were unearthed by the team of archaeologists under the direction of Murat Özgen, the director of the Mimar Sinan Fine Arts University Northern Aegean Research and Application Center. This amazing find happened just two weeks before the end of the year’s seasonal works. In 2017, the team focussed on a field on the Ören Hill, called Region C. There an apse of a big church was found, dating back to the 11th century. This fact confirmed the hypothesis that Adramyttion was destroyed during this period. 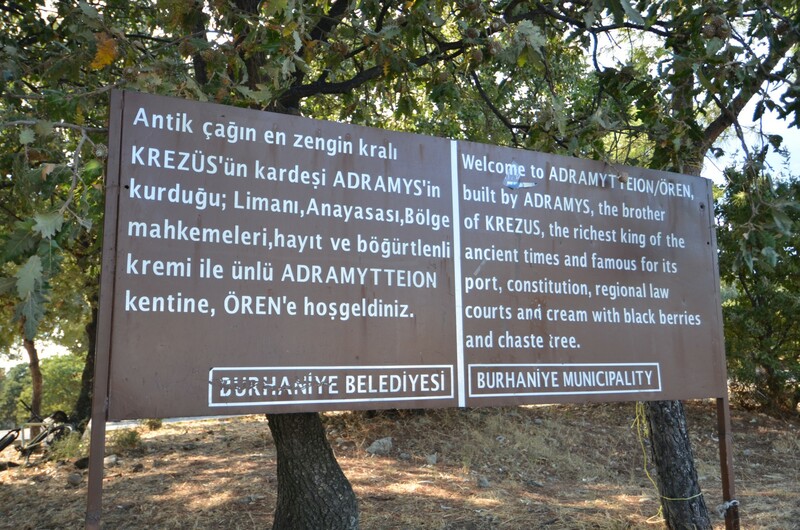 The ruins of ancient Adramyttion, located in the coastal area of ​​Ören, are the most important place, which can be seen during a visit to Burhaniye. 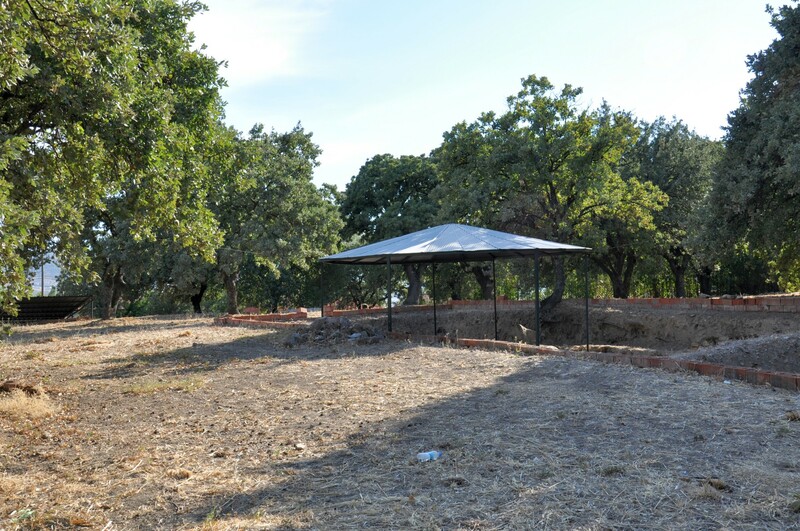 Unfortunately, they are surrounded by a fence protecting the archaeological site, so the opportunity to visit them depends on our powers of persuasion when talking to the researchers working there. Out of excavation season, the possibility of legal entry into the Adramyttion is virtually non-existent. If you are lucky, during the visit to this place you will see fragments of marble blocks with inscriptions, lying near a bay, that once served as a harbour. Under the water, you can even see the outline of an ancient pier. Do not be deceived by brown signposts, placed in Ören, indicate the direction to an open-air theatre (tr. açık hava tiyatrosu). It is a modern structure, built for the organisation of concerts and cultural events, and not - an ancient Greek or Roman theatre. In ​​Ören district, you should look for the Museum of Turkish National Movement (tr. Kuvay-ı Milliye Müzesi). 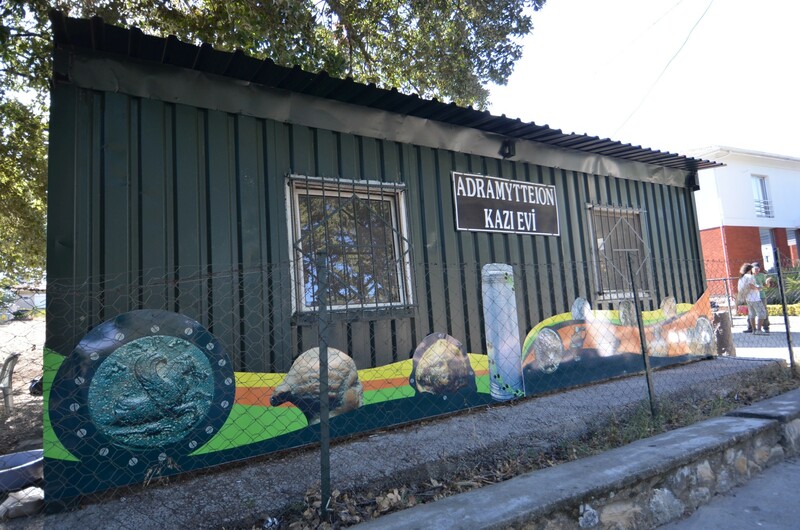 Its name is somewhat misleading because the exhibits collected there consist of a standard mix of archaeological finds from the area of ​​Burhaniye, and ethnographic objects. The museum is next door to Koca Mosque (tr. Koca Camii), built in 1841. In addition, around Burhaniye you can find the so-called neolithic stone altars. Sixteen such places have been discovered so far. They are hidden in the hills between Burhaniye and Havran. An altar usually stands on a hill with a water source. It is a carved rock niche, with stairs, used in prehistoric times for religious purposes. The most famous of them are called Dedekaya and Deliktaş. Burhaniye is divided into two main districts - the central one, bearing the name of Cumhuriyet, and the seaside one, known as Ören. They are situated about four km from each other, which is troublesome for visitors as intercity buses arrive only to Cumhuriyet. All tourist attractions of the town are located in Ören, so you have to take a taxi or painstakingly walk the distance. In Ören, in addition to many hotels and B&Bs, there are grocery stores, restaurants, ATMs, and even a post office. However, you should not compare this town with well-known holiday resorts such as Bodrum and Alanya. It is just a small district, with numerous summer houses, and out of summer season almost all shops and restaurants are closed. By public transport: there are minibuses from Edremit and Ayvalıku (via Gömeç) to the centre of Burhaniye. To get to Ören district, take a taxi or a city bus, or walk 4 km. By car: the road E87 (D550) goes through Burhaniye from Edremit in the north (17 km), to the cities situated along the Aegean coast further to the south: Ayvalık (30 km), Izmir (181 km), and Aydın (283 km). Idahan Hotel - located in the centre of Ören, Sur Street No.17, 200 meters from a sandy beach. Double room with breakfast costs around 250 TL. Pidasus Hotel - also located in Ören, Avni Meto Street No.2. It has a swimming pool, and a beach is just 150 meters away. Expect to pay about 220 T for a double room with breakfast included in the price. Hotel Club Fiord - located in Ören, Ayakli Street No.77, right on a private beach. It has a wide range of rooms and suites - from double rooms to five-bed apartments, at prices ranging from 300 to 800 TL. Teomida Hotel - a luxurious hotel, located close to the coast in İskele district, to the south of the centre of Burhaniye. The hotel has an outdoor swimming pool, a steam bath, and a restaurant. The prices for a double room with breakfast start at 400 TL. Daidalos Hotel - a boutique hotel, located in Taylıeli village, 7 km to the south from the centre of Burhaniye. The main advantage of this hotel is its quiet surroundings, and guests can use a swimming pool and a beautiful garden. Accommodation in a spacious 2-bed apartment with breakfast included costs 200 TL.